The Christmas Man’s name was fantastically literal; he was a man who gave gifts at Christmas. As it turned out he was a bearded old man, much like St Nicholas. 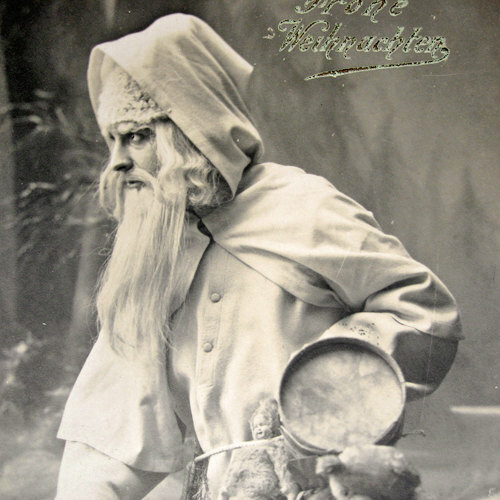 He called into houses to hand out presents to children who had behaved, much like St Nicholas. And he carried a birch rod to beat naughty children, much like St Nicholas. However, the crucial thing for the Protestants was that he was most definitely not St Nicholas. In fact, he was most definitely not a saint at all. In order to definitely not be a saint, he definitely did not wear bishop’s robes or any other religious insignia. And he definitely did not deliver presents on St Nicholas’s Day. Like the Christkind, he instead delivered them on Christmas Day. Which definitely made him the Christmas Man. Definitely, definitely, definitely not St Nicholas. Nope. All similarities to St Nicholas were entirely coincidental. Definitely. “Bad Santas and Other Creepy Christmas Characters” is available now from Simon & Schuster. The image above was lying about on my hard drive and I’ve completely forgotten where I got it from. If it belongs to you then drop me a line and I’ll amend this to give you credit. In Norway and Sweden 13 December is St Lucia’s Day. St Lucia is represented as a beautiful young woman and the day is marked by a procession. A local girl is selected to play the saint. She dresses in white with a red sash and wears a crown of candles on her head. She will parade through the town followed by a series of similarly white-clad girls, each clutching one candle and singing songs dedicated to the saint. Although St Lucia (or St Lucy) is indeed a historical saint, this is actually a relatively recent celebration which began in Sweden in the eighteenth or nineteenth century. But Norway actually celebrated a Lucia (or Lussi) centuries earlier, albeit in a very different form. For the night before 13 December was the Lussinatta or Lucy Night. This was the night when evil spirits and demons rose up to wander the Earth. In these wanderings, Lussi was a hideously evil she-demon with magical powers. She was said to ride through the skies on a broomstick accompanied by demons, evil spirits and trolls, spreading mayhem and chaos wherever she went. Children needed to be good and the adults needed to ward off evil by protecting their homes with the sign of the cross. Otherwise Lussi would make her move – destroying property, crops or livestock, and kidnapping or killing misbehaving children. 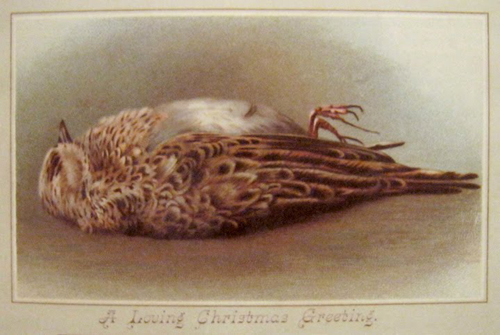 One of the major reasons why the banning of Christmas failed in England was because the threat of abolition caused people of the seventeenth century to fight for their right to continue the traditions they had developed. Many writers even tried to find a character who embodied these Christmas traditions and could be used to appeal for their safekeeping. Writers of the seventeenth century were not masters of subtlety – probably because large segments of the public were illiterate, so books had a limited reach, and playwrights knew that drunken audiences would talk and heckle through most of their plays, so needed constant reminders of what was going on. 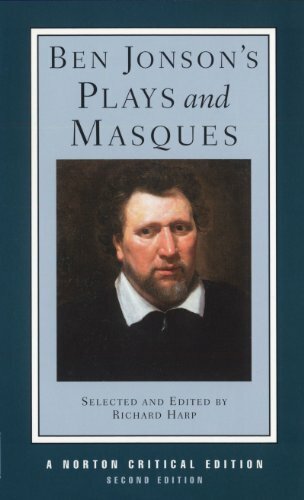 Ben Jonson’s 1616 play Christmas, His Masque features a group of allegorical brothers and sisters with names like Minced Pie, Carol, Mumming, Wassail and Misrule, and he then introduces their father. The father is an old man with a beard who bemoans the fact he is being excluded from Christmas celebrations and implores the audience to keep the traditions alive in the face of growing opposition. This is an early appearance of a character who would soon be featuring in mummers’ plays, stories and newspaper articles everywhere and over the next few hundred years would come to be a ubiquitous figure. 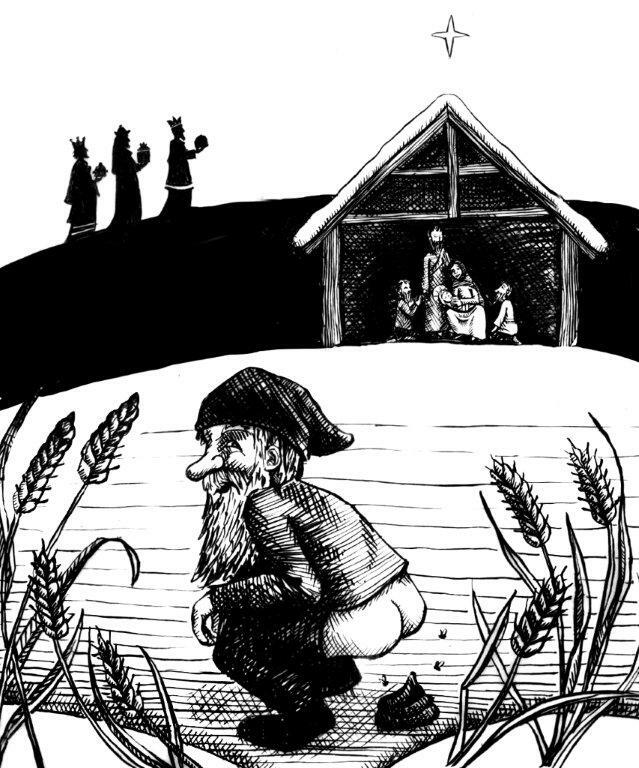 He was a character who came to embody the secular irreligious Christmas traditions that the Puritans despised, but perhaps it was only because of the Puritan opposition that he ever developed at all. His name was Father Christmas. “Bad Santas and Other Creepy Christmas Characters” by Paul Hawkins is published by Simon & Schuster and is available now. The Karakoncolos appears in Bulgaria, Turkey, and Serbia and takes slightly different forms in each country but generally resembles a cross between the Devil and a sasquatch. In Turkey, his behaviour often involves standing on street corners on winter nights waiting for passers-by and asking them riddles. If the traveller gives an answer that includes the word ‘black’ then the Karakoncolos lets them go on their way. But if the passer-by fails to use that word, or indeed fails to answer at all, the Karakoncolos strikes them dead with a single blow. Sometimes his behaviour is more that of a trickster who takes the form of a woman or young girl and appears at people’s doors to con his way inside to be given food. Once inside the Karakoncolos feels compelled to imitate his host’s behaviour. One way of getting rid of him is to set fire to some silk or thread. The Karakancolos will respond in kind by setting his own fur on fire and, upon realising what he has done, will run from the house screaming to find water. Sometimes the Karakoncolos turns up at people’s houses for more sinister reasons. They sometimes use their powers of disguise to pretend to be a loved one and lure the householder out into the snow. Once outside, the person finds themselves caught in a trance unable to move. They stand there frozen to the spot until the cold takes over and they wind up freezing to death. Another favourite trick of the creature in parts of Serbia is to sneak into houses and linger behind the doorways of children’s bedrooms. As the child goes through the doorway the Karakoncolos stretches out a hand and grabs the child by the neck before dragging them off to eat. The Karakoncolos did not always kill its victims, however – particularly in Serbia it is known to use humans as its own personal taxi service. They again lure victims outside before placing them under a spell and leaping onto their back and forcing their captive to ferry them wherever they want to go. The exhausted person is only released at dawn. Bad Santas and Other Creepy Christmas Characters by Paul Hawkins is available now from Simon & Schuster. 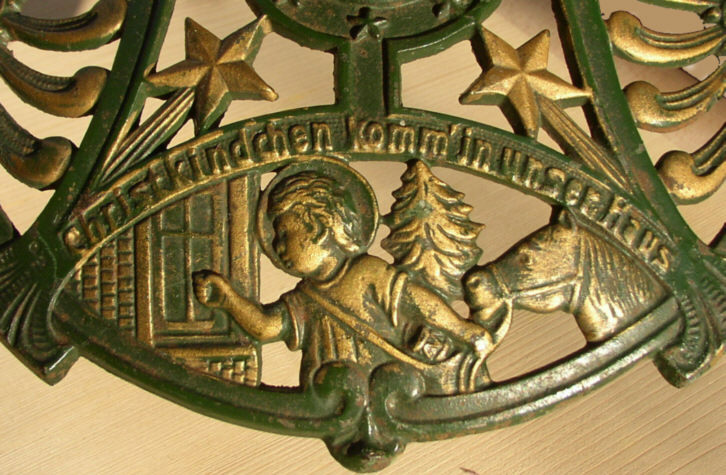 The Christkind (or Christ Child) was an impressively literal creation. Quite simply, it was the baby Jesus, freshly out of his manger and clad in white, who went round Germany and other Lutheran territories delivering gifts to children. The idea was that this was a spiritual figure who would teach children the true meaning of Christmas. Bad Santas and Other Creepy Christmas Characters by Paul Hawkins is available now from Simon & Schuster. The image at the top of the page is available under a Creative Commons license.